Psychiatric Medication or Play Therapy? For me it’s a no-brainer but for millions of unsuspecting parents play therapy is just not an option. Why? Play therapy has, over the years, steadily grown in popularity among clinicians. It has, however, not been accepted by the scientific community and, more often than not, has been criticized for a lack of evidence showing efficacy to support it’s use on a bigger scale. Consequently, its not been offered to parents as an alternative to drugging their children into submission. It’s roots go back a long way. We’ve all experienced it at some point in our lives, it’s just being a kid. Exploring the world, expressing yourself and interacting with other kids and adults while having fun. Think about it for a second. What was the one thing we all craved as children at school? Double history, double maths, geography? – We all wanted to hear that bell – PLAY TIME! Famous philosopher, Plato, once had this to say about play, “you can discover more about a person in an hour of play than in a year of conversation.”. In the eighteenth century Genevan philosopher, Jean-Jacques Rousseau, wrote in his novel, Émile: or, On Education, how important it was to observe play as a vehicle to learn about and understand children. So, in Plato, Rousseau and Fröbel, we have a pretty clear understanding of how play therapy is an important tool in understanding children and their needs. All three are regularly quoted in today’s world. Sadly their work and thoughts on how we should all treat children have been eclipsed by the heavy marketing of child disorders and psychiatric medication. I’d like to step forward in time and offer you three key opinion leaders in the field of mental health, Moreover, I’d like to quote them. First off, Emeritus Professor John Werry, a child psychiatrist “as far as we know” giving SSRIs to babies would not harm them. “But one doesn’t like to give growing and developing kids medications that affect basic bio-cyclic processes because it just doesn’t seem like a good idea unless the kid is really in severe difficulty.” He adds, it would be rare to prescribe antidepressants before the teenage years, and that the youngest child he had prescribed one to was a boy with autism aged 8 or 9, but that was “very exceptional”. Compare the quotes of Plato, Rousseau and Fröbel with Werry, Tuohy and Cotgrove. What can you see? Is it just me or do the latter three appear less compelling and enduring than the former? So, this post is about psychiatric medication vs play therapy. It’s about giving an option to parents who think that medication is the only possible treatment for children with behavioural problems and/or depressive signs. It’s also a post that may interest counsellors, teachers and others who often refer children to mental health services. The authors used a combination of online and offline search procedures to exhaust all resources in locating both unpublished and published play therapy outcome studies. The University of North Texas was a primary offline resource, particularly for unpublished studies. Across the 93 studies, a total of 3,248 boys and girls with diverse presenting issues participated in a play therapy intervention. The 93 studies occurred between 1953–2000. So, given that there is an effective non-medical treatment out there for children with diverse presenting issues, or ADHD, as psychiatry would label it, why do we constantly hear stories about children being hooked on Ritalin, killing themselves on Prozac, Zoloft, Celexa and Paxil, gaining weight on Seroquel? It would be easy for me to suggest that it was just about the money and the way pharmaceutical companies promote their wares. It was also be way too easy for me to suggest that published papers by key opinion leaders [paid by pharmaceutical companies] influence the majority of prescribing healthcare professionals. But perhaps there are hidden dangers with Play Therapy not reported in the literature, that stop it being the intervention of choice for medical and mental health professionals? 1. What effect does play therapy have on a child’s developing brain? 2. Has any child under your care ever become addicted to play therapy? 3. Has any child during the course of receiving play therapy from you ever attempted to self-harm? 4. Has any child during the course of receiving play therapy from you ever attempted suicide? 5. Has any child during the course of receiving play therapy from you ever gained weight as a result of the therapy? Carol answered ‘no’ to questions 2 – 5. Using play therapy in children before medication is even considered should, one would think, be top of any healthcare professional’s list. Alas, the odds are stacked against children in favour of psychiatric medication. This is due to a number of factors. 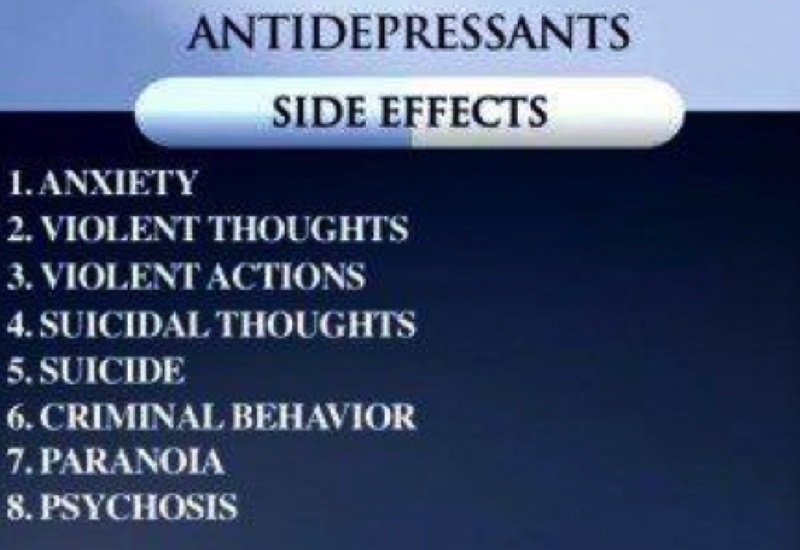 Pharmaceutical companies spend billions on marketing psychiatric medication. 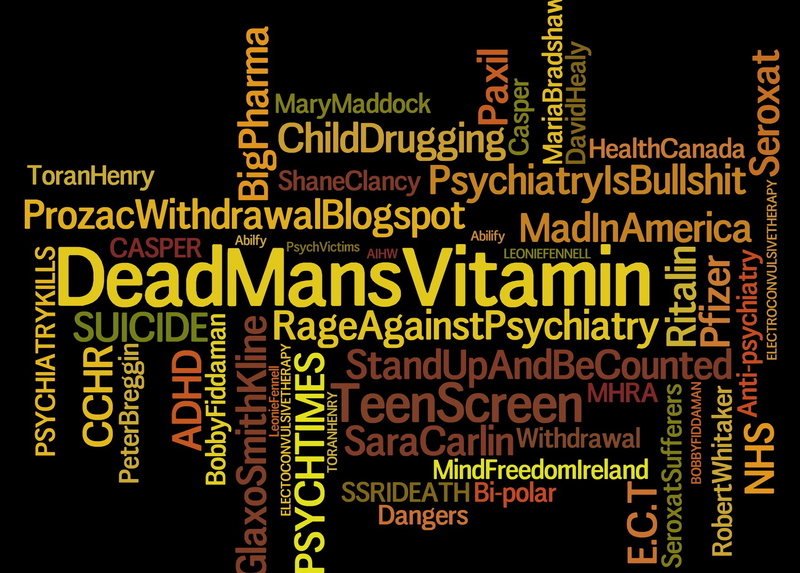 If a specific drug is not deemed by the regulatory authorities to be safe or effective for children, pharma will then hire child psychiatrists to run clinical trials, this, to show the regulators, other healthcare professionals and media that these drugs aren’t dangerous in this target population.Front groups that purport to fly the mental health flag are, in fact, nothing more than agents, pimps for the pharmaceutical industry. 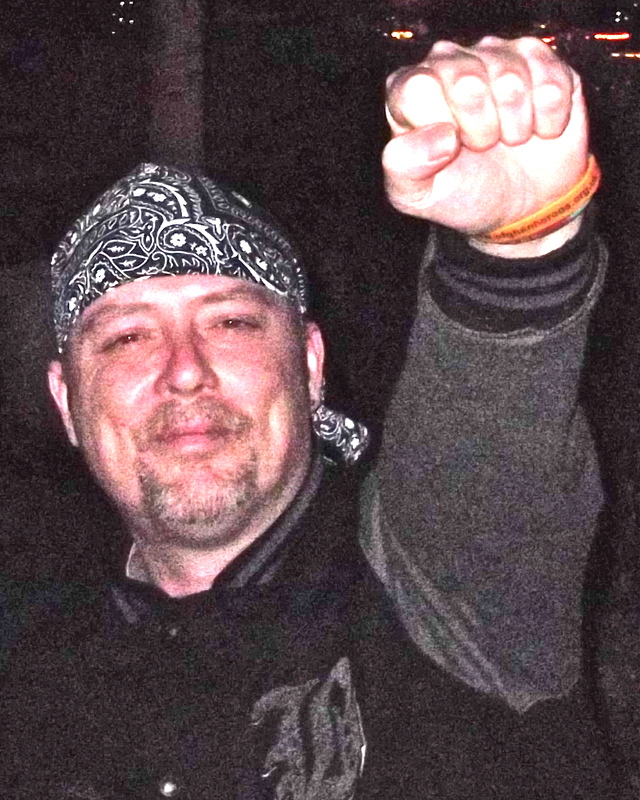 Examples of these front groups can be seen in the the four articles I highlighted back in 2007 entitled, ‘GlaxoSmithKline, Money Trail Down Under‘. , , , Psychiatrists that are well respected among their peers are also targeted by the pharmaceutical industry, often paid huge sums of money to promote the use of antidepressants in children and adolescents.A and B list celebrities must also carry the shoulder of blame. Quite often they are used as advocates for antidepressant type medications, be they famous sports personalities, Hollywood film stars or TV and radio talk show hosts. These people have huge fan bases, many of their fans hang on to every word they say. In many instances they promote psychiatric medication with financial support from the pharmaceutical industry.Play therapists are individual practitioners. Neither they, nor their professional associations have multi-million dollar marketing arms which are able to buy doctors, celebrities or journalists to promote their product. Nor are they able to create or take-over patient advocacy groups with the sole purpose of promoting their work and building revenues. The God factor also comes into play. If you, as a parent, do your own research on the drug your child has been prescribed and you bring your concerns to the prescribing doctor’s table you will, more often than not, be dismissed as either not knowing what you are talking about or be accused of reading too many internet conspiracies. The Play Therapists I have encountered are convinced of the benefits and importance of the work they do but not of their own omnipotence as so many psychiatrists are and are unlikely to promote themselves in quite the way psychiatrists such as Dr Beiderman do in the following famous testimony on his qualifications in a case against pharmaceutical company Johnson & Johnson. In a deposition between Dr. Biederman and lawyers for the states, he was asked what rank he held at Harvard. “Full professor,” he answered. When the competition has that much clout it’s hardly surprising that play therapy, despite its proven efficacy, is rarely used by healthcare professionals. Then there is cost and convenience. It’s so much cheaper and easier for a parent to choose psychiatric medication for their child than it is to enroll them in play therapy sessions. Global governments subsidize prescription medication, this makes taking drugs even cheaper. They do not subsidise Play Therapy which makes it both relatively expensive and unavailable. If your child is distressed, disruptive, anti-social and unhappy, as a parent you need a short term solution but also to weigh the long term risks and benefits of the available interventions. The following chart shows the relative risk of stimulant medication such as ritalin and play therapy on longer term outcomes for kids. Every day parents are taking that risk when they dispense their prescription at the pharmacy on behalf of their children. If a kid is being a kid then let them continue to be a kid. Psychiatric medication as first-line treatment is absurd when the option of play therapy exists. If further evidence were needed regarding the importance of play then The Importance of Play in Promoting Healthy Child Development and Maintaining Strong Parent-Child Bonds  published in the Official Journal of Pediatrics, clearly sends out a stark message, a message that is somewhat contradicted. It’s almost like an add-on, a disclaimer – such is the stranglehold psychiatry has on the modern day. Unless we recognise that Play Therapists are mental health professionals and their therapy addresses stress, anxiety and depression by nurturing rather than damaging children’s growing brains. When weighing up the benefits of psychiatric medication against the risks, one should always remember that there are many adverse reactions reported, some so severe that children have died because the prescribed medication induced their suicide…you cannot get a more adverse reaction than death. Ritalin is widely used in children with behavioural problems. Play therapy, however, report no adverse reactions. Perhaps the following article will sway your opinion. It was published in the Ethical Human Psychology and Psychiatry journal last year. ‘The Risks Associated With Stimulant Medication Use in Child and Adolescent Populations Diagnosed With Attention- Deficit/Hyperactivity Disorder’  was written by Jeanne M. Stolzer, PhD of the University of Nebraska-Kearney. If, after reading all of the above evidence, you still think medicating children and adolescents is safe and effective then you’ll just add to my despair – I can deal with that via some adult play… normally my guitar. Differential regulation of psychostimulant-induced gene expression of brain derived neurotrophic factor and the immediate-early gene Arc in the juvenile and adult brain – European Journal Of Neuroscience [serial online]. February 2009;29(3):465-476. Banerjee P. Differential regulation of psychostimulant-induced gene expression of brain derived neurotrophic factor and the immediate-early gene Arc in the juvenile and adult brain. European Journal Of Neuroscience [serial online]. February 2009;29(3):465-476. Lambert N. The Contribution of Childhood ADHD, Conduct Problems, and Stimulant Treatment to Adolescent and Adult Tobacco and Psychoactive Substance Abuse. Ethical Human Psychology & Psychiatry [serial online]. Winter2005 2005;7(3):197-221. Jeanne, M. S. (2012). The risks associated with stimulant medication use in child and adolescent populations diagnosed with attention- Deficit/Hyperactivity disorder. Ethical Human Psychology and Psychiatry, 14(1), 5-14. Stein, M. (2009). 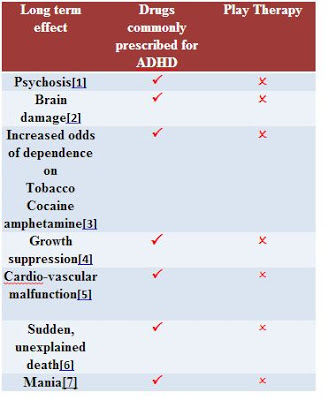 Psychiatric reactions to ADHD medications. Pediatric and Adolescent Medicine, 123, 111–120. ← HEY TEACHERS! LEAVE THEM KIDS ALONE!